Gain client trust, save them money and protect your book of business. Insurers see people at the best and worst of times. Clients trust you to provide informed guidance and help ensure they're protected. Let us help you. 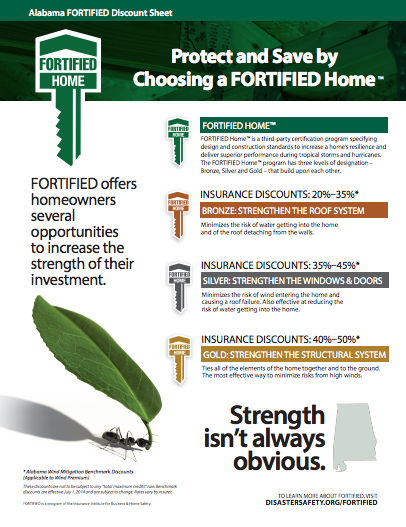 Use the resources below to learn more about FORTIFIED and its benefits. FORTIFIED Wise Credential FORTIFIED Wise training opportunities are held on an ongoing basis in locations throughout the U.S., including Mississippi, Alabama, South Carolina, Oklahoma, Rhode Island and North Carolina. CEUs available. Why FORTIFIED? Supported by the insurance industry, 20 years of research and testing and independently verified using FORTIFIED Evaluators. It can also qualify for insurance incentives or discounts. FORTIFIED Home Overview - FORTIFIED works no matter where your clients live & gives them options based on the weather risks they will face. FORTIFIED INSURANCE DISCOUNTS AND INCENTIVES FORTIFIED can qualify homes and businesses for insurance incentives or discounts from state wind pools and certain insurance companies. Some states have even legislated these discounts or credits. THE ALABAMA COASTAL INSURANCE SHOPPER’S GUIDE provides all the information needed to make informed decisions about homeowners insurance. THE EFFECT OF FORTIFIED™ CONSTRUCTION ON HOME RESALE VALUE Switching from conventional construction standards to FORTIFIED increases the value of a home by nearly 7 percent. EDUCATION Smart Home America has long partnered with Home Builders, contractors and industry professionals to provide education about stronger construction practices, insurance incentives, and the FORTIFIED program. If you or your organization are interested in learning more about FORTIFIED, contact us. THE INSURANCE INSTITUTE FOR BUSINESS AND HOME SAFETY (IBHS) Real-world solutions for building stronger homes and communities. THE INSURERS GUIDE TO FORTIFIED is written for insurers and provides the information and resources you need to help clients and understand FORTIFIED, in one convenient package. ALL FORTIFIED MATERIALS & RESOURCES FORTIFIED Home™ standards, technical summaries, and other documentation are now available in one place, including; requirements, benefits, flyers, logos and other marketing materials.